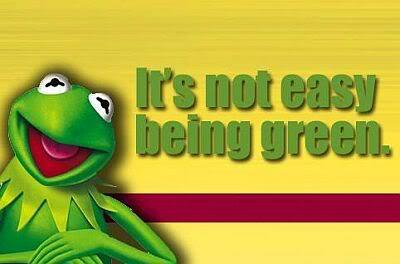 Kermit the Frog was right when he said "It's not easy being green." Sure, when looking at the world there is way to much pollution, and a change is necessary. But being green can get difficult. Like when deciding whether to go with paper, plastic or canvas shopping bags. Or when you have to decipher between trash and recyclables. And to cope with taking short showers with cold water can be dreadful. Not to mention, you're too scared of the dark to turn off all the lights in your house. When you're with 'people', you'll talk big about global warming and pollution, and how we need to go green. But you're really not up for running to class/work by foot EVERY morning. Biking might help... but it's always hard finding a bike rack nearby for you to park in. You could go green by driving a hybrid, but they're to much money to afford driving. And you can't risk being judged driving one of those smart cars. But we can't be apathetic towards the environment as we face this complex crisis. It's up to us to combat this crisis before it becomes a greater challenge for future generations. As Kermit the Frog would say "When green is all there is to be, It could make you wonder why, But why wonder why wonder, I am green, and it'll do fine, It's beautiful, and I think it's what I want to be."